I can’t even remember when I first fell in love with the Peanuts cartoons. I don’t think they were serialised in UK newspapers in the 60’s or 70’s; but I just remember buying badges, books and trinkets with Snoopy on – especially the Joe Cool persona. Peanuts wasn’t just Snoopy of course; Charles M Schulz described the minutiae of every day life for kids all over the world. Personally I associated myself with life’s eternal optimist Charlie Brown; and I still have a thing for ‘red haired girls’ just like him. Even I knew that this wasn’t going to be Charlie serenading Lucy; I’m not that daft! But I hoped; and I’ve been proved correct, this has been a lovely introduction into the world of Jazz. 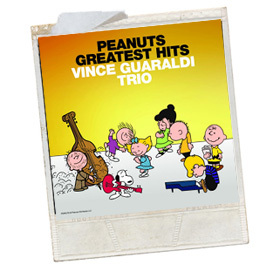 The Vince Guaraldi Trio are just the right tempo for a novice like me; easy going tunes from Mastercraftsmen and obviously the tenuous links to characters and the like does it no harm at all. The album opens with Linus and Lucy, a tune not a million mile away from the them tune to Film 78 with Barry Norman; and it certainly put me into a state of relaxation without the aid of either alcohol or milky tea. Most of the tracks are instrumentals revolving around Guaraldi’s delightful piano playing with just the hint of double bass and drums, whisking the melodies along. While not aux fait with the work as a whole I did recognise the Charlie Brown Theme from the occasional showings on British TV in recent years. While I smiled all the way through I also tapped my toes in time with the beat; which I didn’t expect. Guaraldi only sings once; the very agreeable love song Little Birdie; which could easily be dedicated to a lady of your acquaintance; just don’t tell her it’s about a cute yellow bird. For what it’s worth, Vince Guaraldi’s voice isn’t a million miles away from a young Tony Bennett btw. While the last six tracks are ‘holidays’ themed, with the last four being Christmas tunes apart from the finale Christmas Time is Here which features a children’s choir; the others don’t have sleigh bells or anything, making them listenable all year round. All 12 tracks come from an assortment of albums released between 1965 and 1968; sadly Guaraldi died in 1976 aged 47. Favourites? I can’t resist Oh Good Grief! Chiefly for the title but the tune takes ‘mellow’ into a whole new stratosphere as does the gentle on the mind Christmas is Coming. Mellow? Chilled? Easy Listening? Cool? Yes, that will do Cool is the best word to describe this album; Snoopy would approve.